Tricks 4 U: Have U Ever Watched Star Wars Movie In Windows Command Prompt..?? 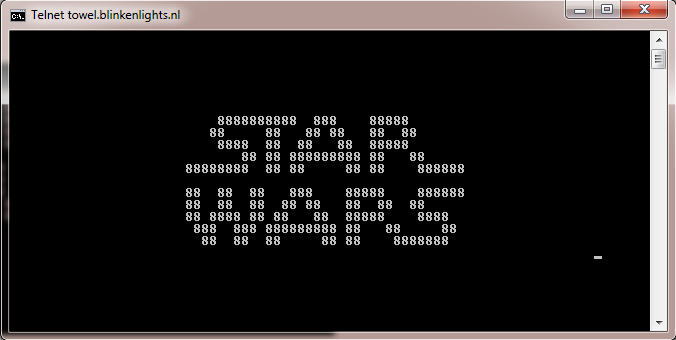 Have U Ever Watched Star Wars Movie In Windows Command Prompt..?? I just wanted to share with you guys, that telnet is not only used for hacking and sending fake E-mails, its used for watching movies too!! Give it a try, I’m gonna show you how.Meanwhile, why don’t you go grab some popcorn? 1) Go to command prompt by going to run and typing cmd, or simply hit windows+R key to open up the run box to make things easy. 2) Type telnet towel.blinkenlights.nl and sit back to watch the show. The procedure on how to enable telnet feature (telnet command) in Windows Vista and 7. Chose Uninstall a program under Programs. Under the Tasks tab, select the option Turn Windows features on or off. After selecting click on OK.
That’s it, your telnet feature is installed. Now you can go to the command line and use the telnet command as you wish. BlueHost is ultimately the best website hosting company with plans for all of your hosting needs.